Our School started its series of concerts in the school year 2018/2019 on November 17th at the Fangorówka mansion in the Botanic Garden of the Polish Academy of Sciences in Powsin. The beautiful Garden was illuminated by the sunny autumn light that contributed much to the artistic atmosphere of the concert. Our pupils and the audience enjoyed this colorful surrounding with pleasure. The extensive program of the concert included diverse and well harmonized works composed by different composers. 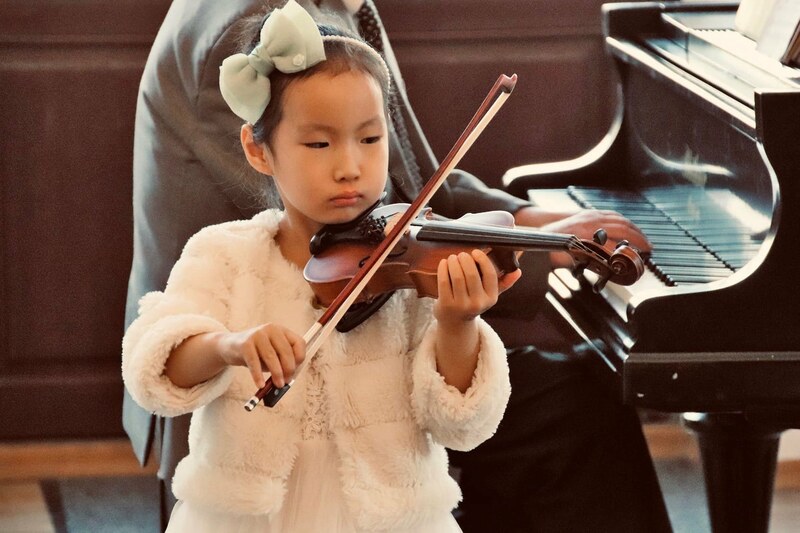 At the beginning we could listen to the very young performers who only recently started their musical education and played simple musical miniatures, as well as more advanced students who performed works by well-known renowned composers of the classical and romantic period. Brothers Robin and Eliasz Schwaengli first performed solo and then played in duet. Elias played “Dzwony”(Bells) by Agnieszka Lasko, and Robin – leading motive from Giuseppe Verdi’s “La donna e mobile”, then both, in duet, played “Walc piesków”” (Doggi’s waltz) by Artobalawska. Matilde d’Orgerval performed “Etude in c-minor no. 4 for virtuoso” by Karol Czerny and two waltzes (in gis-minor and d-minor) by Johannes Brahms. Marysia Frączak played “Romance” by Charles Dancla’. Natalya Voloshyna (violin) who performed “Legend” – the renowned work by Henryk Wieniawski. Zofia Zwolińska – the Director of the UNISONO Music School – congratulated all soloists, both the youngest beginners and the elder and more advanced students, as well as all teachers, for their work and artistry, and exposed especially the progress made by the pupils that brings benefit and satisfaction to all of us. Finally, Director Zwolińska invited all to the next concert (Concert of Carrols) that will be held on January the 19th next year. The concert ended, as usual, with candies for all.